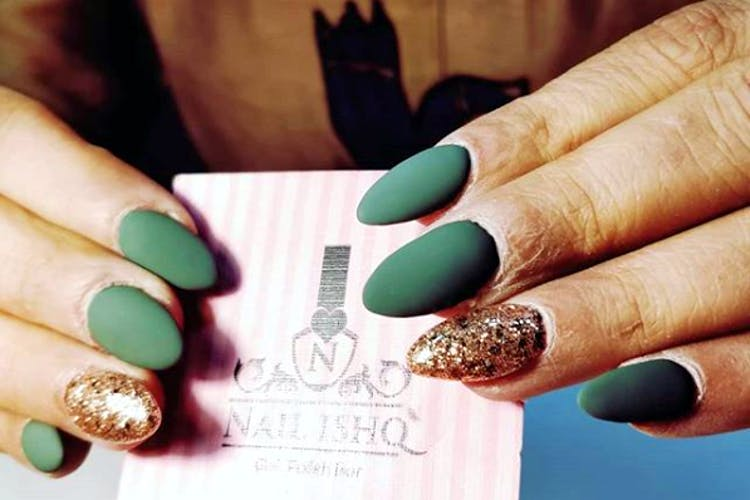 Get your nails done in on-trend styles at Nail Ishq, a cutesy nail salon in Banjara Hills. What’s more? It is located right inside one of our favourite dessert cafe — Guilt Trip, so you can tuck into cupcakes too. You know what’s better than having pretty nails? Nails that are artsy which Nail Ishq is nailing. This tiny nail salon was started by a software engineer turned artist, Sahithi Reddy who is super passionate about the work she does now. Their appointment calendar is always full and if you’re planning to go here to eat cupcakes and get your nail art done on the same day, you might want to hit them up at least 24 hours in advance. Nail Ishq offers only specific professional services that use gel products. They are strictly against the use of monomer and acrylic nail paints as these are internationally banned because they damage nails. Hence, the goal is to offer gel based nail services at affordable prices and make the crowd move over the traditional nail painting methods. Think, instead, Insta-worthy trends like bead nail art, crystal nails, ombre nails, and themed nails and get them done here. This nail bar also offers dry manicure and pedicures along with nail extensions. So whatever be your mood, you can now express it through your nails too. The price for a basic gel polish of any solid colour is INR 500 (both hands). For metallic colours, it is INR 799 and a full bridal nail session complete with beads and crystals can go on upto INR 10,000. We wish the space was a little bigger as it can get congested sometimes. We recommend ordering yourself some crunchy blueberry macaroons or the delicious hazelnut paste and vanilla ice cream waffles like we did, and chilling out with your girl gang before you all have a pampering nail art session.